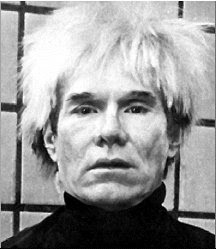 Andy Warhol is not my favourite. He is not in the top 1,000 of my favourite artists. He is not anywhere, in fact. FaceBook friends have occasionally (not so) gently abused me for this viewpoint. But Jonathan Jones got it dead on, as usual, in his latest Guardian piece: "like the late, great art critic Robert Hughes, the artist of soup cans and car crashes, prophet of celebrity culture and pioneer of the hands-off business approach to art, was a moral reprobate and aesthetic fraud". Jones points in astute directions: "However, in a powerful investigative article for the New York Review of Books, the art critic Richard Dorment suggests connections between the planned sell-off, the closure of the Warhol authentication board and a series of legal disputes about what is a "real" Warhol work. There is a poison at the heart of Warhol's legacy. It is this: most of his works from around 1970 onwards were made in off-site studios that he never visited. He simply sent templates for the paintings and prints to be made from, and signed the finished works when they were sent to him. Warhol started by parodying factory methods, and went on to rely on them." I suspect that the art market is awash with fakes of Mr Warhol. In a booming art market, some collectors put on their "money blinkers" and sign the cheques. Some collectors have had their work "denied" as genuine and lawsuits are flying around. Warhol, I suspect, would have just giggled. Jones sums it up: 'Warhol's prices today are phenomenal. But how authentic are those "masterpieces" that sell for millions? Is there even such a thing as a genuine Andy Warhol? What you see is what you get, said Warhol. He was joking, as usual".